When I change out activities, manipulatives, and pretend play areas in my classroom, I am always looking to add in a couple of super simple activities that involve very little prep and can almost instantly become independent learning centers for my preschoolers. When I’m the only teacher in the classroom, this helps my classroom management too. And if you’ve ever tried to accomplish any small task like giving your attention to a small group activity while keeping an eye on 12 preschoolers, simple activities are a must! 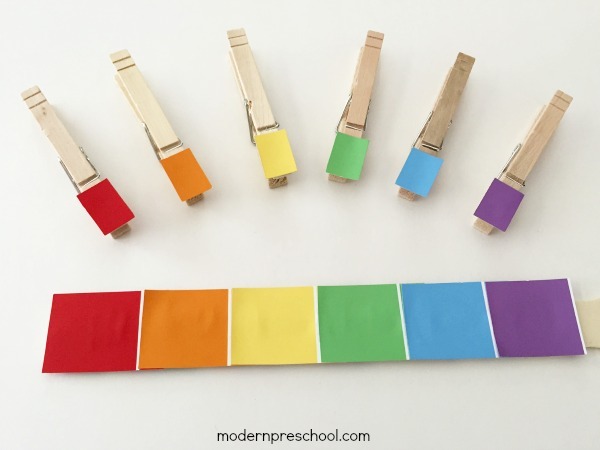 Just like if you are trying to make dinner, unload the dishwasher, and help with homework simultaneously, your toddler or preschooler at home needs a simple busy bag like our rainbow paint chip color match activity to play with! One of the best things about this busy bag is that it can be put together for free (or almost free!). I raided our local paint department and grabbed most of what was needed. Decide on the colors that you would like to use for this activity. I chose the simple colors in a rainbow — RED, ORANGE, YELLOW, GREEN, BLUE, PURPLE. Adding in other colors like pink, turquoise, black, brown, white, and gray would be fun too. The stirring stick had approximately 9 inches of space to work with. I was using 6 colors, so I decided that each color would show 1.5 inches. To make it easier to attach the colors to the stick and to each other, I measured the 1.5 inches and then cut below the white line on the paint chip sample also. This allowed me to glue the paint colors to each other and to the stick. 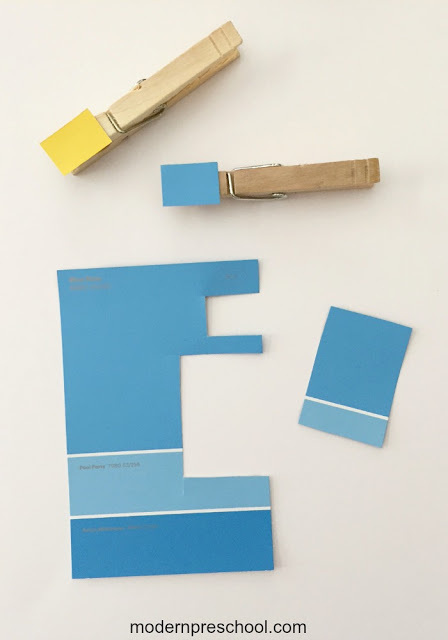 I cut small rectangles out of the same paint chip colors and glued each to a clothespin. 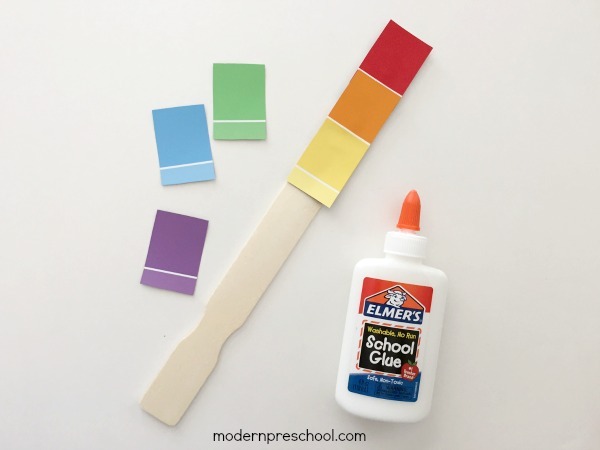 I glued the paint chip colors in rainbow order with liquid school glue. I was careful to attach the colors together, but still allow the white line to show. This helped separate the rainbow colors on the stick. The object of the activity is to match the colors on the clothespins with the colors on the paint stick. Drop all of the clothespins with glued colors on them into a cup or small bucket. Pick one out, clip it to the correct paint chip color on the stirring stick! 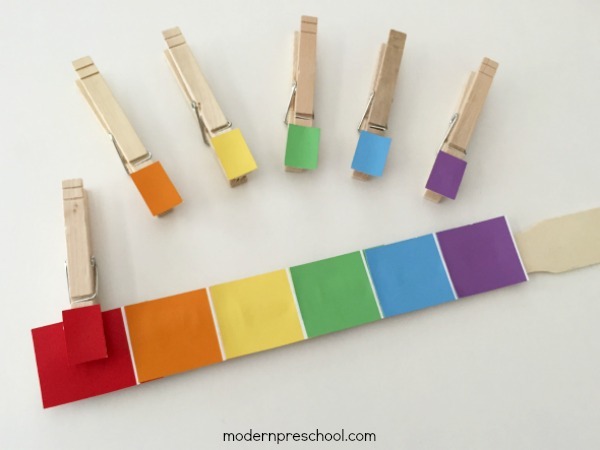 Pick another clothespin and play again! 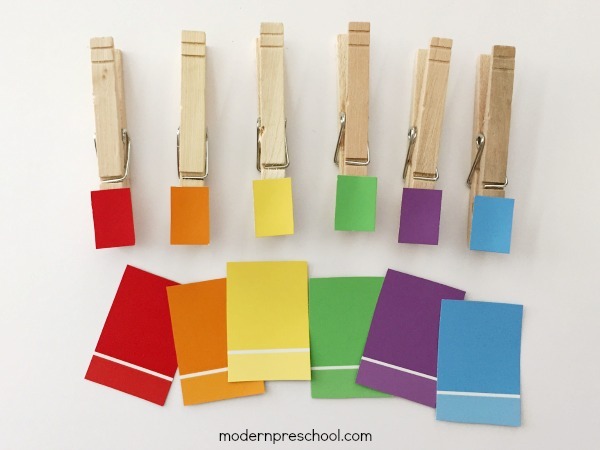 To add a little more to the activity, create 2 sets of clothespins for each color. 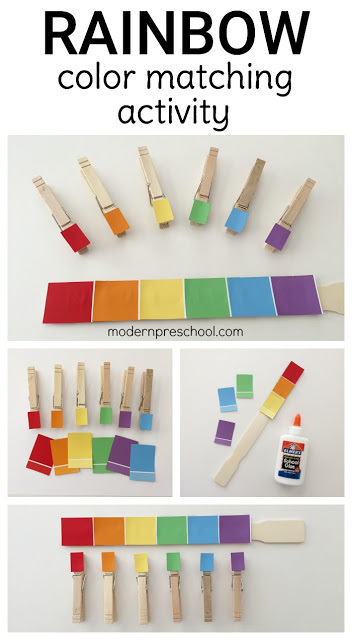 Have your child clip 1 clothespin to each side of the paint stick. This not only takes a little extra time, but also works problem solving skills too. It’s not as easy to clip a clothespin with your non-dominant hand! This activity works on color naming and color matching skills. It also strengthens fine motor skills, which help with handwriting in the future. Forming letters correctly and cutting on crazy curvy lines is not easy without strong muscles and practice! 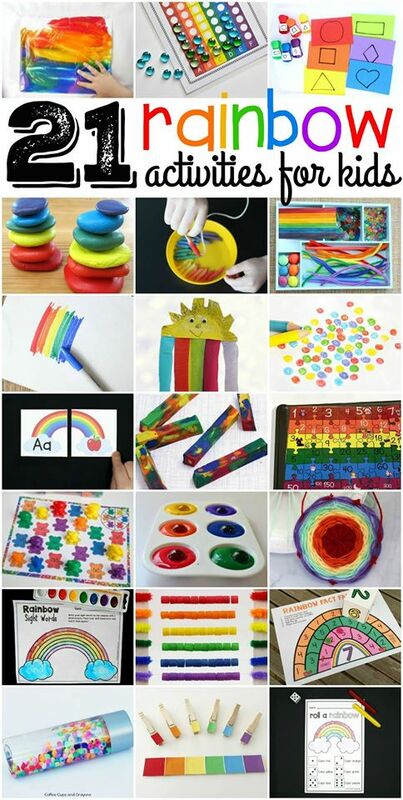 Check out all of these rainbow themed ideas from other fabulous bloggers!